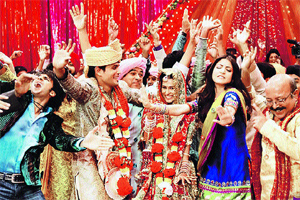 The first, in a series of big films revolved around weddings and the clichéd happily-ever-after. Audiences will never forget Ms. Dixit’s bright green lehenga (try as they might!) or her bright purple saree. A wedding favourite of the time was played endlessly on every possible top ten film countdown – “Didi tera devar deewana.” Tracks like “Jootey do paise lo” also found favour in public opinion. A classic was born here and the track “Mehndi laga ke rakhna” became a cult favourite at desi mehndi parties everywhere. Shah Rukh in his Pathani suit and Kajol in her henna-green outfit became popular role models for young guys and girls around the world. Of course, that the movie went on to become a huge hit is a whole other story. And yes, no one will ever forget Kajol chasing after Shah Rukh aboard a train – a scene that “inspired” many other future films! Again, the invincible Shah Rukh-Kajol pair was at work creating another melodramatic saga that everyone remembered for a long time. Rani Mukherjee and Salman Khan completed the ensemble cast. It’s amazing how everyone remembers Kajol’s transformation from Plain Jane to Femme Fatale rather well. The song “Saajan ji ghar aaye” introduced Kajol in her demure, ultra-desi avatar. While the title of the film may not ring a bell, the song “Chal pyaar karegi” certainly was popular. Salman Khan (again!) played the leading role in this love story that had Twinkle Khanna at the receiving end of his affection. A typical Bollywood production, this film featured yet another sangeet song that had people dancing at weddings. Who can forget Bachchan Senior shaking a leg to “Shava Shava”? Accompanied by other superstars like Shah Rukh Khan, Hrithik Roshan, Kajol, Rani Mukherjee and Jaya Bachchan, this film was a cinematic coup simply on account of its star cast. “Bole Chudiyaan” became an instant hit with its huge sets, designer wear and ostentatious display. Big, big, big was the key theme here! “Say na, say na” was a popular track thanks to its great dhol bassline and a gorgeous Priyanka Chopra dressed in a chiffon saree. For the ladies, Aby’s Baby (Abhishek Bachchan) proved that he could shake a leg and give his father some serious competition at home. This engagement song found listeners everywhere! “Maahi ve” featured a resplendent Preity Zinta in a blue ensemble whereas her two handsome leading men, Shah Rukh Khan and Saif Ali Khan, wore designer sherwanis, co-ordinated down to the last detail. Replete with sentimental mothers, crazy families and lots of children, this one was for the masses! With a title dedicated to marriages itself, you can’t be too far in selecting songs for celebration. Shahid Kapoor and Amrita Rao played the young couple who overcome all odds in their pursuit of love. Tracks popular from this album are “Mujhe haq hai” amongst others. A vivacious Rani Mukherjee and a flamboyant Saif Ali Khan came together for this semi-animated caper. Gore Gore had Rani Mukherjee showing off her dancing skills while Saif Ali Khan had ample opportunity to display his newly acquired muscular bod! 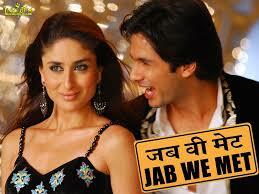 In recent times, Jab We Met presented Kareena Kapoor and Shahid Kapoor in a young boy-meets-girl story. Mauja Mauja and Nagada both are tracks that are great for any wedding party. You gotta love the Punjabis and their joie de vivre! As far as fashion statements go, the Patiala was reinvented with Kareena pairing it up with a ultra-chic strappy top. Tip: Picking out wedding songs can be challenging. Why not leave it to the experts? Look at our Vendors list to pick a DJ who can keep things moving all night long!